If you are looking for a fun present for a new mom then this tank top could be it. 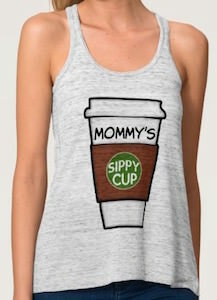 On the tank top you see a picture of a paper coffee cup with on it the words “Mommy’s Sippy Cup” and that seems to be accurate if mommy loves coffee as baby likes milk. It’s just a funny shirt that just tells the story about a mom loving her coffee. You can get this women’s tank top in many colors and in sizes XSmall – 2XL so that there is the perfect fit for you. And sure this tank top is great as a mothers day present or maybe just for fun.